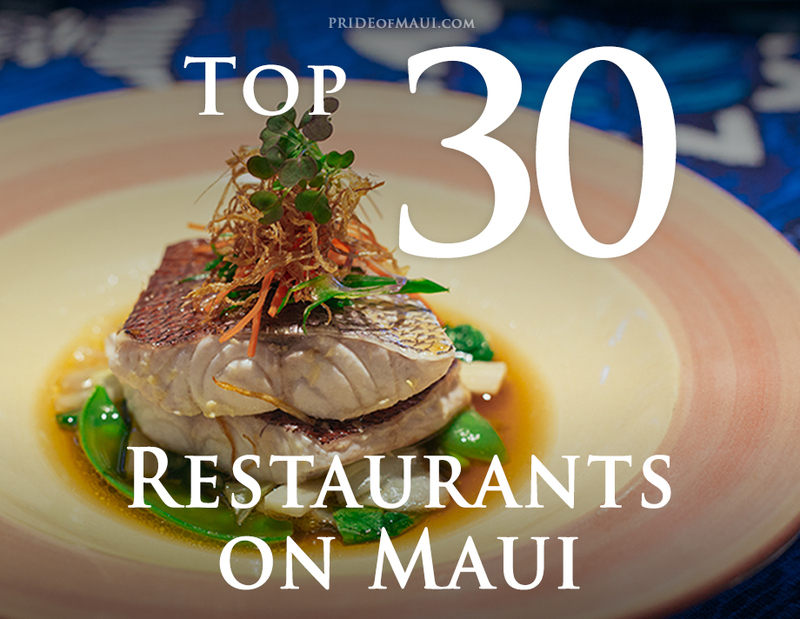 Aloha Nui Loa, and welcome to our 2018 Top 30 Restaurants on Maui blog review! Maui is not only one of the most popularly traveled to islands in the world, but it is also full of some of the most delicious dining choices in all of Hawaii. While visiting the illustrious Island of Maui, make sure to check out the different flavors of the island, ranging from trendy food trucks to the ultra fabulous 5-Star dining locales. We have carefully researched and done the groundwork for this article so that our readers can enjoy the very best Maui restaurants for 2018. So, save your appetite and get excited! Don’t be shy, it’s okay to daydream about the incredibly buttery smooth Maui avocados, the sweet and aromatic fresh mangoes, the crisp organic produce, free-range meats, and the ‘oh-so-fresh’ seafood that Maui offers island-style foodies and culinary enthusiasts. Sure you’ll plan a snorkel cruise, go on jungle hikes, see the sunrise at Haleakala — all fabulous Maui adventures! 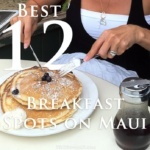 But, a trip to Maui isn’t complete without visiting the top restaurants on Maui… Bon Appetit! Mama’s Fish House is located on the North Shore of Maui in Ku’au. This restaurant is not just any ordinary dining establishment, it is a full-on culinary spectacle, one that deserves to be enjoyed by every single set of feet that land on the gorgeous Island of Maui. The North Shore view is awe-inspiring, and sunsets are astounding. Making reservations at Mama’s Fish House should be embedded in your mind as a vacation activity that cannot be missed! Just like a Whale Watching Tour in Hawaii or an adventurous Snorkel Trip in Maui, a meal at Mama’s is an unforgettable experience; a culinary gift that you will most definitely treasure for years to come. At Mama’s, guests will thoroughly enjoy a revolving, and eclectic Polynesian influenced menu. All seafood is caught by local fishermen on a daily basis, and locally sustainable components are abundantly used throughout each dish. Only the finest ingredients are utilized at Mama’s Fish House, and it is more than obvious to the eye and your palette! Next time your cruising through South Maui, make sure to stop for a meal at Nalu’s South Shore Grill. Whether you choose to check them out for breakfast, lunch, happy hour or dinner- it will always be amazing! Located near the Ace Hardware store in the Azeka Plaza, you’ll notice that just the sight of Nalu’s is both enticing and inviting. Here, you’ll find that the vibes are just as full of aloha as the menu. 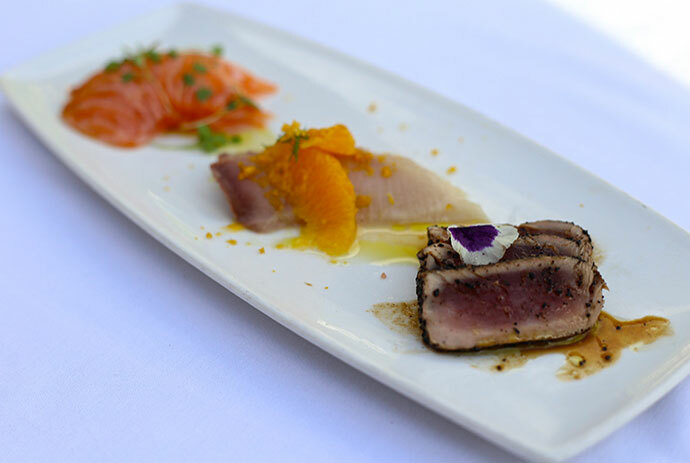 At Nalu’s, savor an innovative island-style menu full of healthy and fresh ingredients: locally grown produce, healthy meats, freshly caught seafood, Maui made food products and more. Want to stay hydrated? Make sure to try all of their infused waters that are available as a courtesy (more like a gift) to their clientele. Our favorites are the Pineapple Lemon and the Cucumber Mint- they are so refreshing! They also have kombucha and handcrafted Maui beers on tap, plus an amazing cocktail menu with a mouthwatering Kim Chee Bloody Mary, a delish Mai Tai, and a Hawaiian Superman! It’s not just that Nalu’s is a cool restaurant with an amazing menu and staff, they also have this really incredible attention to detail throughout their menu and customer offerings. Sometimes it’s those kinds of surprises with a streamlined approach to customer satisfaction that really makes a restaurant stand out from the rest. That is why they are at the top of our list! 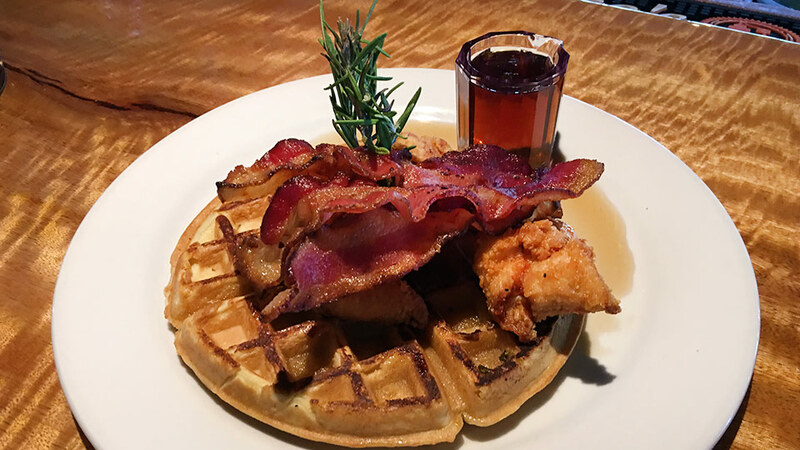 When at Nalu’s, make sure to try some of their most popular menu items like their Apple Brie Burger with homemade chips or the Fried Chicken and Waffles. Their Poke Bowl is fantastic, and their volcano fries and calamari are the best on the island, for sure. For dessert? Just go for it! Try all of their malasadas — you definitely won’t regret it. Monkeypod Kitchen is one of Chef Peter Merriman’s newest culinary ventures. Located in Wailea with dramatic Pacific Ocean views, Monkeypod has quickly become one of Maui’s most popular dining destinations. Their fusion menu is diverse, blending many cultural flavors and local ingredients in a fresh new way. From their fashionable cocktail creations to their Lunch and Dinner items, Monkeypod is full of unique and delicious selections. 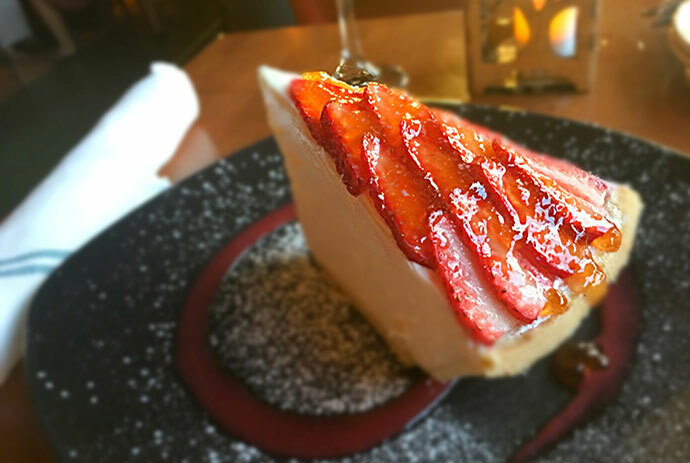 With over 36 craft beers on tap, a kiawe wood-burning oven, and the best homemade cream pies on Maui, it is obvious that Monkeypod knows what they’re doing. Without a doubt, Monkeypod Kitchen in Wailea has one of the best lunch and dinner menus in Hawaii. What makes their menu so unique is their twist on traditional and modern lunch classics with a fusion of Hawaii Regional Cuisine. 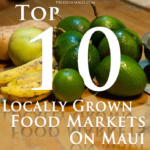 We also love how they use local Maui vendors throughout their menu! At Monkeypod, guests can choose from a tempting assortment of menu items. You may just find yourself ordering more than you need because every item is just so inviting! Their menu brings even more with yummy burgers and seafood dishes, steak plates, and gorgeous salad and sandwich options. Don’t sleep on the local style offerings- with fresh, local and sustainable ingredients, they are excellent here. This is a fun, casual, and social Maui restaurant, a wonderful spot for a Lunch date for two, or a family meal. Without a doubt, you will absolutely fall in love with this Maui restaurant! Maui Brewing Company is Maui’s premier handcrafted craft beer maker. With a tasting room in South Maui and a great brewpub restaurant in Kahana, we highly recommend that you check out both spots during your next foodie adventure in Maui. At the Kahana brew-pub, guests can taste all flavors of Maui Brewing Co. craft beers; accompanied by a unique menu. Here, guests of all types can choose items off of their menu, even vegans, and vegetarians, which is a really unique offering for a brewpub. The menu is broken down by salads, burgers and sandwiches, flatbreads, entrees, sliders and ‘share, pair and taste’ plates. They even have a kids menu with easy options for the Keiki like cheese pizza, fried chicken bites, mac and cheese and a burger. If you like a little bit of spicy with your frothy beer, definitely order the Shishito Peppers. 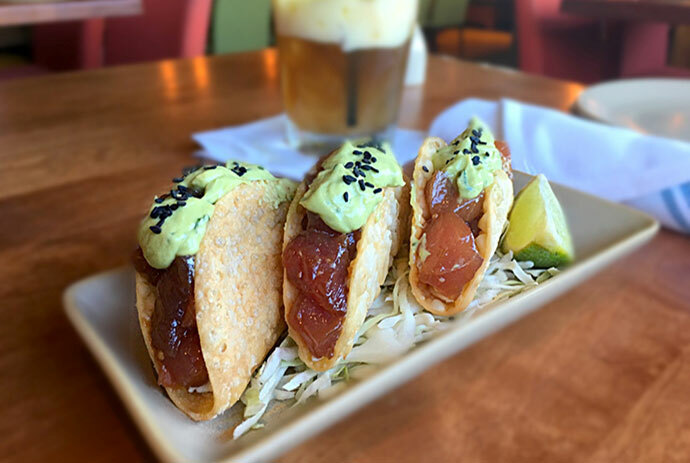 When at the Maui Brewing Company restaurant in West Maui, consider ordering items “family-style.” The casual environment invites menu exploration, and it’s super fun to pair items off of their menu with beer selections. The staff is all very beer knowledgeable, so don’t be afraid to ask for recommendations. This is a perfect spot for lunch, happy hour and dinner in West Maui. 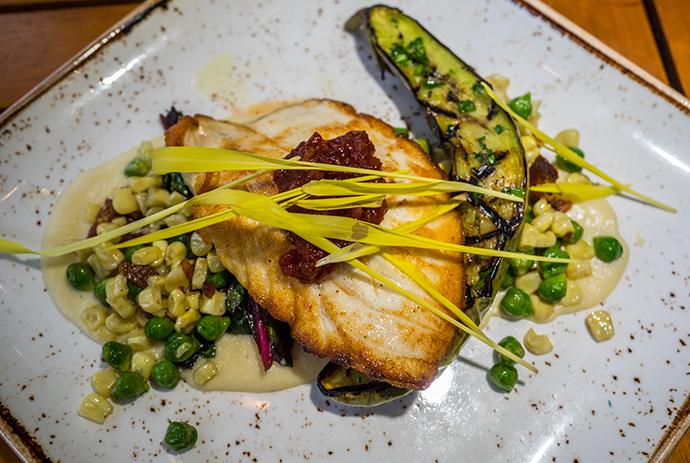 Located in the Kapalua Resort is one of Maui’s newest and most amazing restaurants, Taverna. Taverna is open Monday-Friday for Lunch, daily Dinner Service (after 5:30 pm), and Weekend Brunch. With huge Pacific Ocean and award-winning fairway views, here’s a hot spot to put on your Maui dining bucket list. It’s quite a large restaurant with a huge wrap around bar and a spacious dining room. Without a doubt, attention to detail and eye for the interior design were definitely applied when creating this Maui restaurant. Taverna’s menu is a total culinary journey through rustic Italian classics fused with locally grown ingredients; organic produce, freshly caught seafood and local meats. Dishes are organized by Antipasti (starters & pizzas), Share Plates, Contorni (sides), Primi (pasta) and Piatti Principali (main dishes). There are so many amazing things on their menu; we suggest you order a selection. 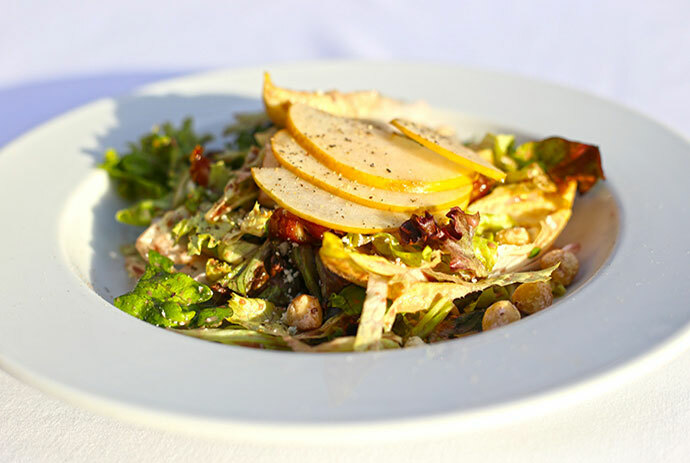 The dressing on their Insalata Cesare is out of this world- it’s truly a perfect Caesar. The Fritto Misto is also impressive offering no just fried calamari, but crusted shrimp a spicy tomato jam, arugula, and aioli. We also loved sharing the Taverna Polpette: beef and bacon meatballs with tomato sauce and grilled ciabatta. Plate portions are pretty much spot on here- not too much and not too little, allowing you to continue to the main dishes. We highly suggest ordering the Linguine con Vongole, Saltimbocca di Pollo or the Costine Corte di Manzo, a slow braised beef short rib. The wine list is extra impressive with beautiful varietals from California Central Coast areas (Paso Robles, Santa Barbara, etc), various Italian regionals and more. If you love a rich Barbera Asti, crisp Chardonnay or satiating Moscato with your Italian cuisine, they have you covered. 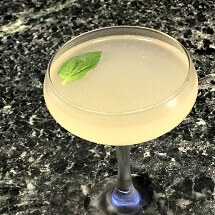 The cocktail list at Taverna isn’t just award-winning but features a true selection of mixology masterpieces. 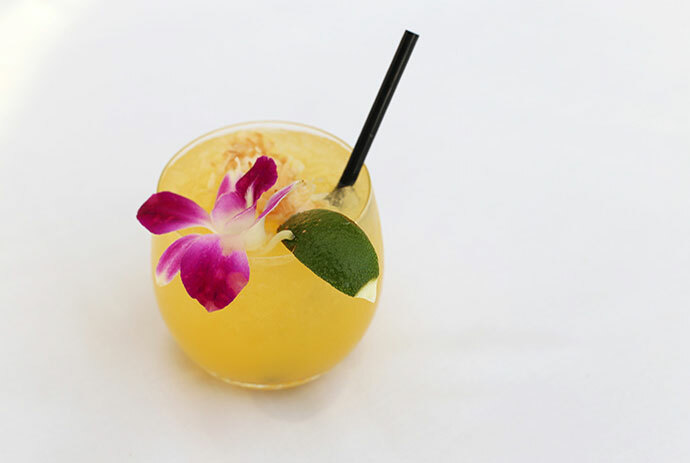 Try one of their Aperol Spritz and Negroni options, and taste the ‘Bankolada,’ a craft cocktail that won the ‘Best Cocktail’ award during the 2018 Kapalua Wine & Food Festival. Others winning libations include the ‘Burning Man-Hattan’ (Bulleit Rye, Carpano Antica, House Bitters, and Smoked Seasonal Wood). For more information please visit the Taverna. 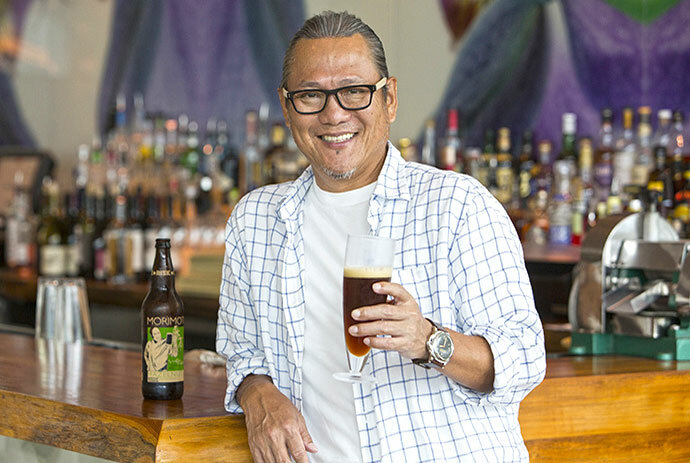 Located at the Andaz Maui Resort in Wailea, Morimoto is named after the highly-acclaimed celebrity Chef Masaharu Morimoto of Iron Chef and Iron Chef America. Besides being one of the best restaurants in Maui, guests will also surely enjoy breathtaking views of Mokapu Beach while savoring a tasty meal. Morimoto’s menu is full of local, farm and ocean fresh ingredients. Popular items are hand-rolled sushi, fresh fish, steak and seasonal cocktails with a Japanese and Western flair. While mouthwatering Lunch and Dinner options are offered daily, we suggest making reservations for Dinner to watch the magnificent sunset fade into Maui’s glistening Pacific Ocean. The assortment of delicious sushi and sashimi is world famous, and you definitely need to enjoy those with the Aged Morimoto Sake. For dessert, try the Doughnuts, which come in a variety of flavors like Waialua chocolate, sake caramel, and apple-banana cheesecake. The house-made sorbet is also to die for! The Island of Maui has needed a restaurant like The Pink & Cork for so long! 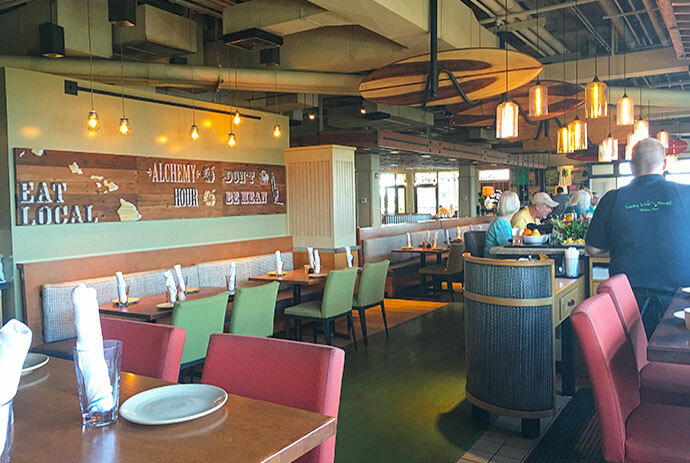 Located in the Shops at Wailea, The Pint & Cork is where you’ll find an island-style version of gastronomy gone brewpub. Great for weekend breakfasts (they have a Bloody Mary bar), and daily lunch, happy hour, dinner and late-night dining, here’s a spot to put on your Maui rotation. At The Pint & Cork, enjoy a casual environment with great food, professional local-style customer service, and excellent menu offerings. Have a bite to eat before or after beach hopping in South Maui, catch a game on one of their big screens or plan a fun date night with a new friend. 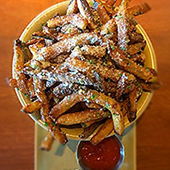 The Eat Menu at The Pint & Cork is full of satisfying selections for everyone. Off of the Burgers/Sandwiches menu, try the Ahi Sandwich, or their famous Bib Burger made with ground beef, white cheddar, charred onion, fried egg, pickle, arugula, whiskey 1000 and a melt-in-your-mouth brioche bun. Specialty plates include Shrimp & Grits (only place on Maui you’ll find this! ), a Charcuterie Platter and their popular Mac & Cheese. If you love a perfectly cooked steak, make sure to order the 16oz Ribeye Steak. Don’t sleep on the Happy Hour Menu, and enjoy a welcomed sigh of relief because The Pint & Cork also has a Kids Menu (Root Beer Float included). Let’s discuss the Drinks Menu at The Pint & Cork. Here’s your go-to place for local Hawaii beers, domestics and craft beers that you won’t be able to find elsewhere on Maui. Ordering a burger and a beer at Pint & Cork is kind of like a marriage made in paradise. If beer isn’t your thing, make sure to explore their cocktail menu. Many restaurants claim ‘mixology’ skills, but The Pint & Cork live it. There are many spectacular things in prospect for you if you’ve never been to the Hali’imaile General Store in Upcountry-Maui. For those that have been here, perhaps even numerous times, you know what we’re talking about. Located just a 10-minute drive up Baldwin Avenue from the Historic Paia Town, guests will surely find one of Maui’s best restaurants tucked amongst sugar cane fields and a lot of local history. 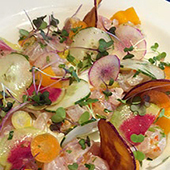 Hali’imaile General Store is Chef Bev Gannon’s first and most renowned restaurant in Maui. Here, you’ll find a menu full of creative American-Pacific, Pacific-Hawaii Regional, and Asian-style cuisine. Yes, that sounds like a lot in the mix, but in Hawaii, this is the creme de la creme for soul food island-style. Since the late 1980s, Hali’imaile has not only been one of the top restaurants in Maui, but also a vacation destination for Maui’s many loved visitors. 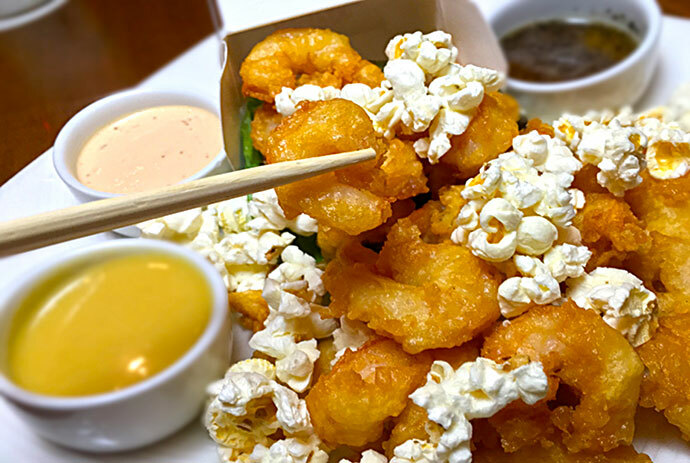 At Hali’imaile, foodie lovers can explore a menu full of tempting selections like the Kalua Pork & Goat Cheese Wontons, Popcorn Shrimp (the best ever! 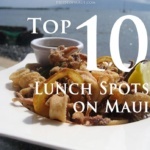 ), Togarashi Shishito Peppers, Furikake Crusted Ahi & Coconut Shrimp, Paniolo Pork Ribs, Hali’imaile’s Tri-Tip “Plate Lunch,” and of course Bev’s Famous Crab Pizza, which is to-die-for by the way. 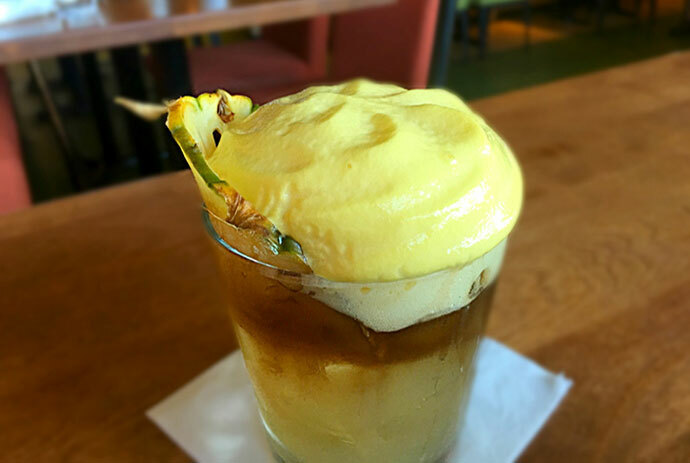 The cocktail list is superb with a handful of amazing libations, and the dessert menu is a real winner with items like the Lilikoi Creme Brûlée and a lovely Pineapple Upside-Down Cake. More fabulous things about the Hali’imaile General Store include an awesome bar with a conveniently cool daily happy hour from 3-5:30 pm, sweet local vibes, and a host of foodie-related events that take place throughout the week, month, season and year. When you visit Maui, you just have to get to Bev’s Hali’imaile General Store. Housed by Old-Hawaii plantation architecture, and offering a fabulous menu, you cannot go wrong here. In addition, Ka’ana Kitchen is famed for its use of locally grown Maui ingredients from the Ka’ana Farm, Ono Farms, Surfing Goat Dairy, Waipoli Hydroponic Napili, Ho’opono Farms, Kapa’a Farms, Flo Farms, and Evonuk Farms. We adore the Maui restaurants that support local! Located at the Four Seasons Resort Maui in Wailea, Ferraro’s offers daily oceanfront dining for lunch and dinner. With live music Tuesday-Saturday and one of the best vantage points in South Maui for a magical Maui sunset scene, this is one of the most romantic places to enjoy an outdoor meal on Maui. Sit back, relax, and order a crisp New Zealand Sauvignon Blanc, or a refreshing muddled cocktail before your meal. With a menu that highlights classic and re-imagined Italian and Pacific-Rim fusion dishes, we recommend everything! The whole menu is tasty and innovative with an Italia rustic twist. The service at Ferraro’s is always spot on, and the menu has something for everyone with a special “Wellness Menu,” vegan and vegetarian options. When dining at the Four Seasons in Maui, you can’t go wrong. 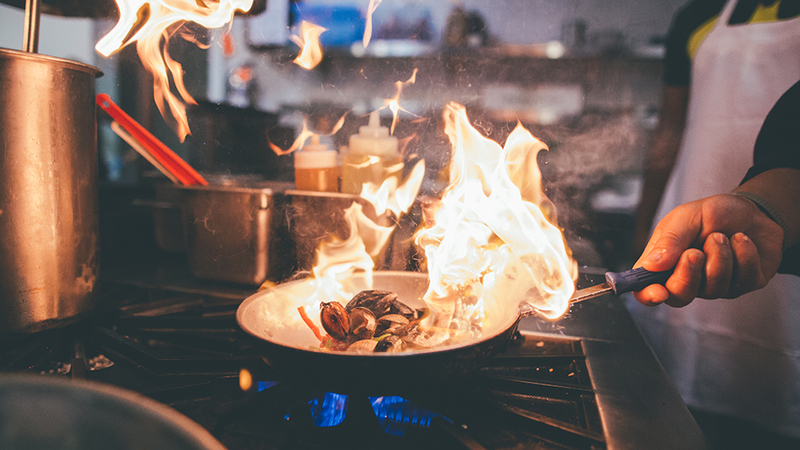 With a culinary team headed by Executive Chef Craig Dryhurst and Executive Sous Chef Marco Calenzo, no attention to detail is ever left out. Ferraro’s is definitely deserving of being on the top of our best restaurants in Maui list with their fabulous location, incredible service, and an all-around incredible menu. Lahaina Grill is located in West Maui in the heart of the Historic Town of Lahaina. For over 21 years, Lahaina Grill has maintained its status as one of the best restaurants on Maui and rightfully deserved. Lahaina Grill is a wonderful culinary establishment, and they have definitely perfected their version of New American cuisine, blended with the freshest island ingredients and international culinary techniques. When dining at the Lahaina Grill, enjoy their menu full of tantalizing selections. If you love escargot, Lahaina Grill is definitely the spot for this on Maui. They’re mouthwatering, baked and served with a light curry, herb, and garlic butter sauce. The Wagyu Beef Ravioli is also divine with a mushroom brandy cream sauce* More starting plates that you shouldn’t miss out on are the Bufala Tomato Salad (Big Island Kamuela tomatoes), the Golden and Red Beet salad and the Maui Onion Soup- a perfectly executed version of this classic. For entrees, you’ll have a hard time deciding because there are so many fantastic options! 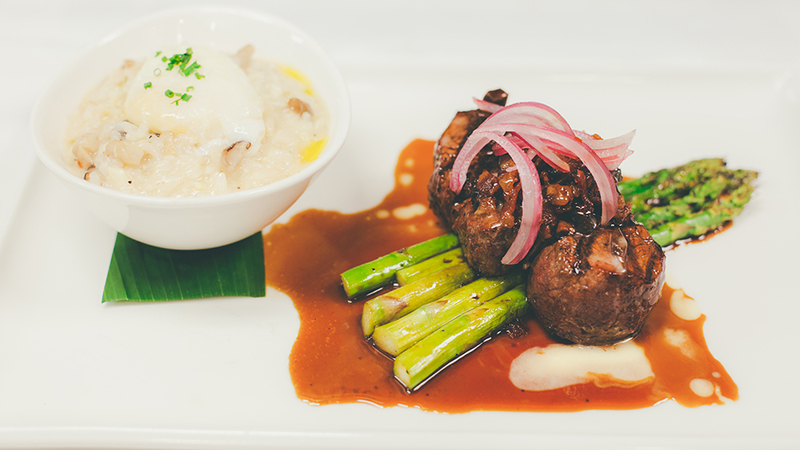 Choose from gorgeous selections like the Filet Mignon, Osso Bucco, Kona Coffee Roasted Rack of Lamb, Surf & Turf and the Maui Onion and Sesame Seed Crusted Seared Ahi. Do not forget to order a side of the Keahole Lobster Risotto — it’s so amazing! 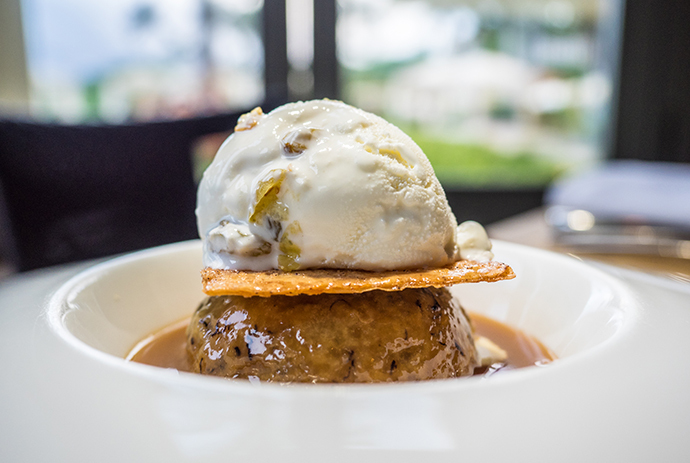 Here, the desserts are also heavenly which should not come as a surprise… our favorites are the Road to Hana Vintage Hawaiian Cake and the Kula Lime Tart. Lahaina Grill also has a superior wine menu with fantastic regional varieties. We know that you’re really going to enjoy your dinner at Lahaina Grill! The Restaurant at Hotel Wailea is located in the same space that was once known as the Capische restaurant. The resort didn’t just re-brand the restaurant, they completely changed gears. When at the Restaurant at Hotel Wailea, look forward to a menu full of locally grown and sourced Hawaii ingredients: organic produce, free-range meats, and locally caught seafood options. Overall, the menu is pretty impressive here. 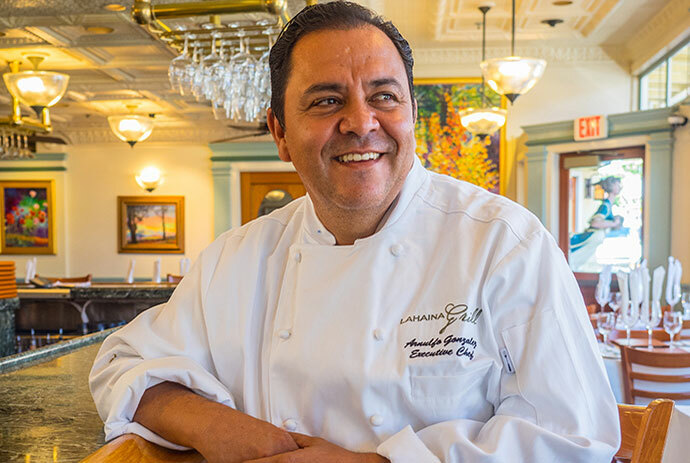 Although you’ll most definitely find some twists on classic Hawaii Regional cuisine, there are also very creative elements that can only come from a chef with a background in many culinary lineages; Classic American, French, Italian and Japanese. For starters, order the Oysters on the Shell, Hawaiian Ahi Poke Crackers, Hirabara Farms Young Kale Salad and the Ginger Rubbed Tako. That should get your taste buds prepared for what’s next! All of the entrees are appetizing; our favorites being the Local Snapper, Macadamia Nut Crusted Lamb Chops and the Center Cut Prime Tenderloin. The cocktail, wine, and dessert menus are all divine. Dinner with a view in Wailea is never a bad idea, but dinner with a view from Hotel Wailea will definitely become a fast favorite. This is a great place to celebrate an anniversary or delight in a date night. They also have live music on Fridays with one of Maui’s favorite musician’s on the piano keys- Mark Johnstone. For Lunch, visitors can enjoy a family-style meal by choosing a variety of share plates, or order per guest. The appetizer menu offers incredible first tastes with Bev’s Famous Crab Dip, Coconut Curry Mussels, Kalua Pig Spring Rolls and the delicious Haiku Caprese Salad. Off of the Makai (ocean), Mauka (land) and Wailea Classics menu, guests can order fish and steak plates, salads, pasta, burgers, and sandwiches. The Dinner menu at Gannon’s is quite extensive and even includes gluten-free and vegetarian options. Every guest will fall in love with selections off the Appetizer, Raw Bar, Salad, Makai (ocean) and Mauka (land) menus. The Iceberg Wedge Salad is classically nostalgic, and the Sesame Crusted Ahi is a great item to order for those that love to explore the more traditional flavors of the island. 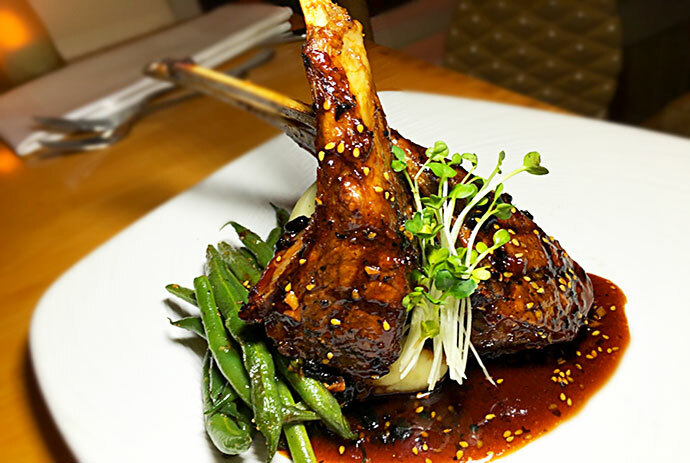 Carnivores will be in heaven here with mouthwatering selections like the Ginger Hoisin Short Ribs, 14 oz. Aged New York Steak and the Sonoma Lamb Rack. The restaurant is open daily, and they offer many special engagements throughout the week like happy hour specials in their Red Bar, movie nights and live music. It is also an ideal Maui restaurant for holiday meals, anniversary celebrations, and large group dinners. Honu Seafood & Pizza has yet again, another amazing Mark Ellman menu. Honu is located on Front Street behind the Lahaina Cannery Mall, a perfect spot to enjoy ocean views and a tantalizing menu. During the day, you can see honu, Maui’s Green Hawaiian Sea Turtles right swimming right below the dining area. Sunset here is awesome, and at night you will definitely see a star-filled Maui sky. This is a great place to go for lunch, on a dinner date and with your whole family in tow. Merriman’s Kapalua is located in West Maui at one of the most incredible oceanfront locations within the Kapalua Resort. Merriman’s on Maui offers a wonderful farm-to-table style menu, using only the finest organic and sustainable products from the Hawaiian Islands. 90% of their award-winning menu is locally sourced, and their culinary creations are outstanding. Here, guests can enjoy indoor and outdoor seating, and relax to the sounds of Live Music and the hypnotic rolling waves of Kapalua Bay each evening. 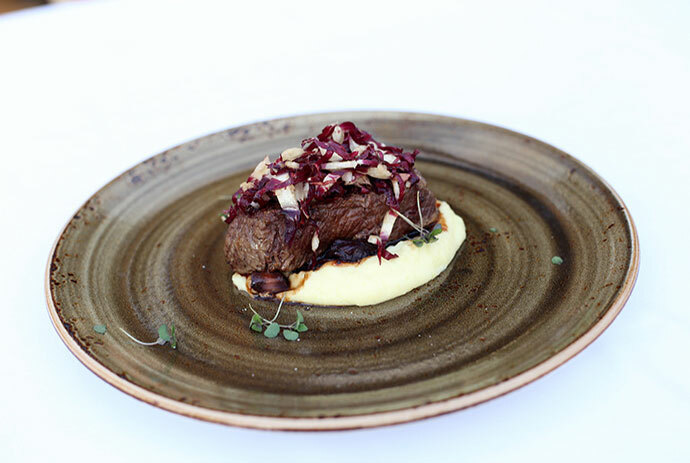 When dining at Merriman’s in Kapalua, savor all parts of their menu as it has been carefully devised to tantalize your senses. For dessert, marvel in the Toasted Coconut Creme Brulee or the Maui Gold Pineapple and Toasted Macadamia Nut Brioche Pain Perdu. Last but not least, definitely make sure to peruse Merriman’s Wine Menu, it is an overtly impressive assortment. “Oh, Star Noodle…let me count the many ways that I love thee….” Yes, words like those will enter your mind as you thoroughly enjoy dining at Star Noodle. Star Noodle is located off the beaten path in Lahaina, West Maui. This super delicious and trendy Maui restaurant is popular for many reasons, including the fantastic Pan-Asian menu and the stylish setting. Dining at Star Noodle is so fabulous, the food is so finger-licking, and the environment makes you feel transported to the “coolest restaurant ever.” Nothing on the menu could ever possibly disappoint you, from the genius Sake Cocktail creations to the Shared Plates, Noodles, Sweets, and Wine List. When at Star Noodle, make sure to savor every bite. But no worries, you can always plan another trip to Maui just for another fabulous Star Noodle Dinner. 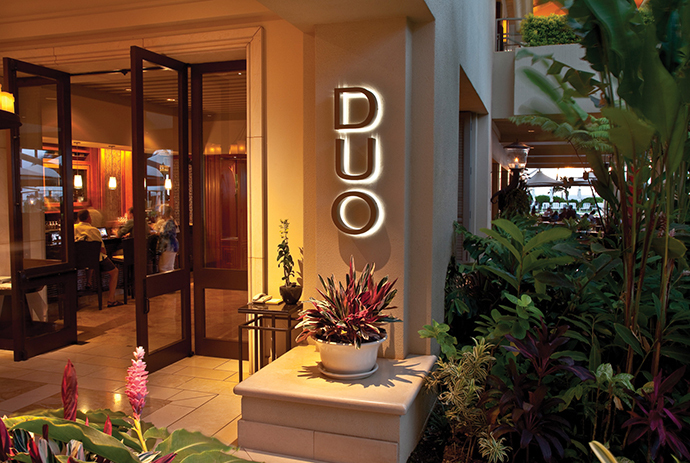 DUO Steak and Seafood is another amazing restaurant located at the Maui Four Seasons Resort in Wailea. DUO is located on the ground floor of the resort and offers both indoor and outdoor dining options. Here, you’ll find an a la carte menu and breakfast buffet daily, and magical dinners. This Maui steakhouse restaurant offers a full dinner menu from 5:30-9pm 7-days a week. The chefs (including the amazing pastry chef, Chef Emily) at DUO also have a gracious willingness to prepare vegan dishes, and more customized plates pending dietary restrictions. This is definitely something super special about dining at DUO. Every Friday Night is ‘Market Night,’ which provides an additional Maui farm-to-table buffet-style assortment of artisan cheeses, a meat carving station, seafood station and a beautiful salad bar. Market Night at Four Seasons Maui is a pretty incredible offering for both residents and visitors, also providing a special child care area and a Keiki buffet. With impeccable service, proximity to live music, amazing Maui sunsets, and a pleasant tropical atmosphere, DUO will easily become part of your Maui restaurant repertoire. 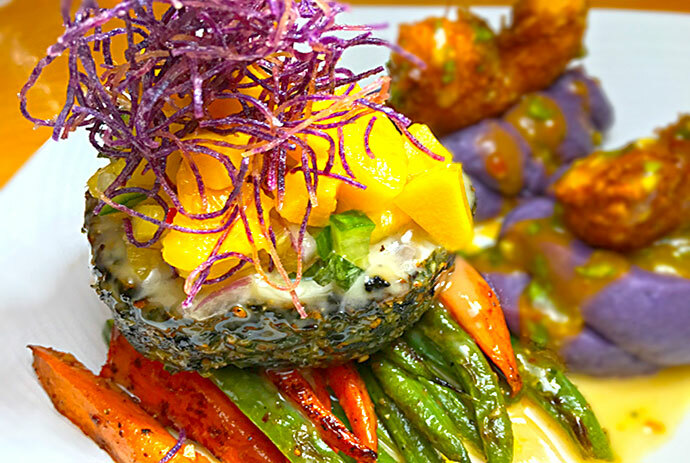 Japengo is celebrated for serving up some of Maui’s most delicious and exotic Pacific Rim cuisine. Offering an Asian inspired menu that is infused with Hawaiian flavors, this renowned world-class restaurant is located at the Hyatt Regency Maui in Ka’anapali. Situated next to the resort’s waterfalls, and overlooking the gorgeous Ka’anapali Beach, you just can’t beat the location! Japengo is the perfect place for a romantic dinner for two, or for a gathering with friends and family. In fact, you, and your guests will definitely enjoy a gorgeous Maui sunset while sipping delicious handcrafted cocktails on their outdoor patio. Sushi connoisseurs will love sitting at the Sushi Bar at Japengo. Here, you can watch top-notch sushi chefs create the most mouthwatering sushi rolls and sashimi at their contemporary Sushi Lounge. We suggest ordering the Omakase (chef choice). You won’t regret it! Here, the local fish and seafood is some of the freshest we’ve tasted on island. It’s all sourced from local Hawaiian Islands as well as Japan. If sushi is not your thing, don’t worry, you will not be disappointed. There’s a huge variety of tasty ‘cooked’ dishes on the menu. 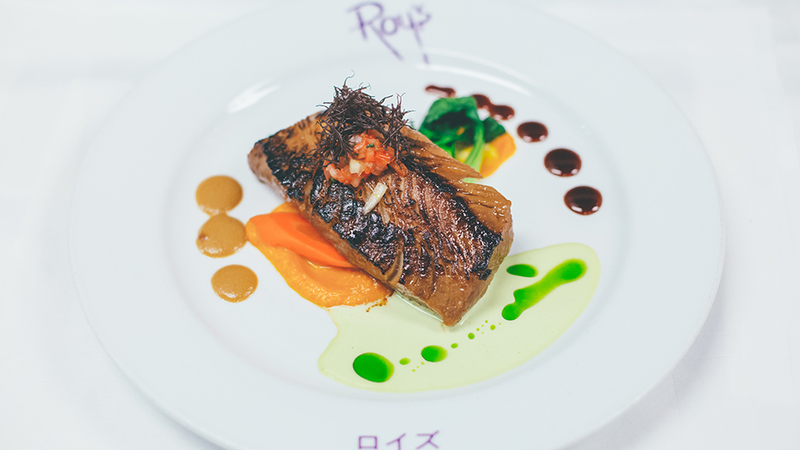 Try the Ribeye or the Pork Belly, both are sophisticatedly prepared using only the freshest ingredients. We highly recommended making reservations in advance, as Japengo tends to book- up fast, especially during the sunset hours. For more information, please visit Japengo. For a truly unique dining experience on Maui, consider booking dinner at the Chef’s Table at the Mill House. Located in the Maui Tropical Plantation, here is where you’ll find a weekly (every Saturday) interactive culinary experience enjoyed with a chef’s perspective. The Chef’s Table is an opportunity to take pleasure in a multi-course menu in an engaging environment. The evening is curated by a rotating selection of Mill House chefs, and allow guests to observe the preparation and cooking experience while learning about the menu items, their inspiration, culinary techniques, and the farms from which the ingredients are sourced from. At the Maui Chef’s Table, diners gather in the Mill House to share a foodie experience full of tantalizing flavors and locally grown Maui foods. It’s a fantastic opportunity to savor meats, seafood, produce, cheeses, fresh cut herbs, and more ingredients grown right here on the Valley Isle. Guests are encouraged to walk up to the chef’s table to meet the chefs, take photos, and ask questions. Without a doubt, all will savor incredible dishes, and delight in the wine pairings and mixology cocktails. It’s truly a Maui dining experience like no other. In addition, visiting and local foodie enthusiasts can enjoy the Mill House restaurant every day from 11am-9pm (Happy Hour is 2-5pm daily). The menu offers something for everyone and is broken down by creatively curated menus: Bites, Chef’s Plates, Garden + Grains, and Fish + Livestock. The menu items rotate based on seasonal ingredients, but you can always count on fresh and delicious items like charcuterie boards, crudos, salads, pasta, flavorful local seafood and meat dishes. 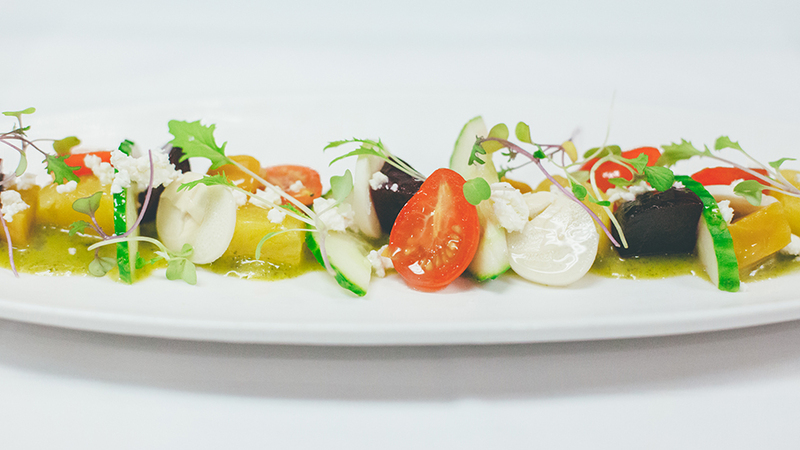 For more information about the Chef’s Table at the Mill House, visit Maui Chefs Table. For more information about the Mill House, please visit Mill House Maui. NUKA is possibly the most authentic modern-Japanese restaurant in Hawaii, not just the Island of Maui. Owned by the Paia Fish Market family, this is without a doubt, totally their tour de force Maui restaurant. Tucked away in the beautifully elusive Haiku community, NUKA is located off Haiku Road; adjacent the Haiku Post Office and the Aloha Aina Center. There aren’t many seats, so make reservations, or plan ahead accordingly. If you love authentic Japanese cuisine, you do not want to miss out on this Maui dining experience. The NUKA owners made a fabulous, and most definitely well-planned out decision to appoint Chef Hiro Takanashi the Head Chef at this North Shore locale. Hiro is a well know Maui sushi chef extraordinaire with previous stints at Jacques North Shore Bistro and Moana Cafe. A Makawao local favorite since 1986, Casanova’s in Makawao started as a deli with morning lattes and freshly baked pastries. They have since grown into what it is today, a fabulous full-service cafe and restaurant that’s busy from breakfast to dinner. 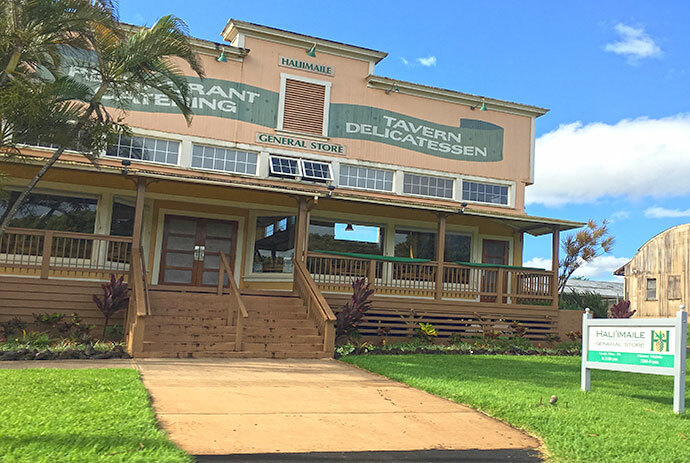 They’re also well known for awesome happy hours, live dinner music, and some super cool rotating club-like nights throughout the week (Makawao location). Known for always providing amazingly cooked honestly Italian food, guests will also adore their brick oven pizzas. Served at every table upon seating, the focaccia bread is extremely flavorful and served with balsamic vinegar and olive oil. The salads, pasta, and entrees are all amazing; the desserts change constantly at Casanovas. Just ask your server for recommendations if you’re overwhelmed with choices. They are all more than willing to help you create a full-on incredible homestyle Italian dinner in Maui. We love Casanovas! Casanovas has two main locations; Casanova Restaurant & Deli (Makawao), and the ultra-swank Bistro Casanova (Kahului), great for a power lunch or extended happy hour. The menus at these locations have some similarities with key pasta dishes, but there are a few differences. It’s definitely worth it to check them both out. They’ll easily slide into your go-to Maui restaurants repertoire. Smack dab in the center of the trendy bohemian town of Paia, visitors will find Milagros Food Company. You definitely will want to check out this amazing family run restaurant with its covered sidewalk seating right in the heart of Paia. Located on the corner of Hana Highway and Baldwin Avenue, Milagros is the perfect spot for a date night and/or hanging out with friends and family. Everyone will enjoy front row seating to some of the best people watching on island. Plus, there is nothing more satisfying then a refreshing margarita paired with a giant pile of kalua pork nachos, after spending an afternoon of shopping at Paia’s chic boutiques. Milagros is serving up some tasty flavors that harmoniously combine Southwestern cuisine with Maui’s freshest locally sourced foods. 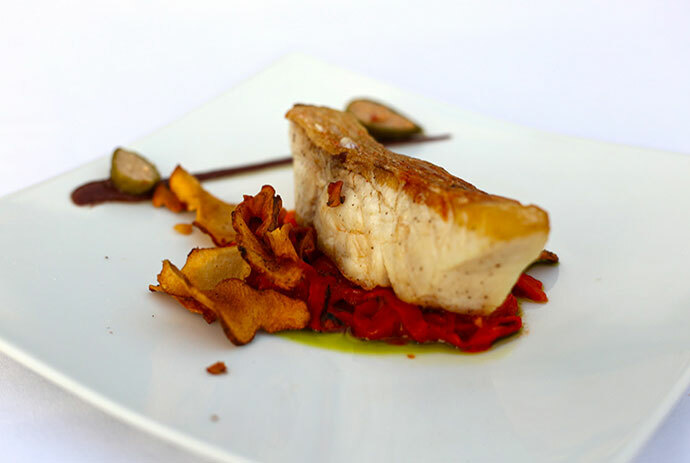 Signature dishes include lots of fresh fish! One of our favorite lunch items is the mouthwatering fresh fish burrito, made to order grilled or blackened. What really makes Milagros’ burritos pop is the delicious combination of their homemade beans and famous guacamole. If fish is not your thing, the fire grilled burger is hands down one of the best burgers on island! The dinner menu also offers many delectable seafood dishes. The spicy shrimp and panko crusted Mahi Mahi are a couple of our favorites, and don’t forget to ask your server about the daily specials. The Keiki (children) menu is sure to please both kids and parents, offering affordable simple dishes that all kids love. Open for lunch and dinner, and don’t forget happy hour! Offered daily from 3-6pm, you don’t want to miss this one! Featuring special prices on their delicious house margaritas, Maui Brewing Company beer, glasses of red and white wine and of course a specialty cocktail of the day. They also have a daily happy hour food special that never disappoints. For daily happy hour specials check out Milagros Instagram page! Tequila enthusiast will love the outstanding selection of tequila here. Last, we visited, we counted more than 10 different kinds of tequila ranging from traditional labels and mango flavored to ultra-premiums that are sipped from a sniffer. For more information, please visit Milagros. Paia Fish Market’s flagship location, established in 1989, is on the corner of Baldwin Avenue and Hana Highway in Paia Town. They also have two other locations in Kihei and Lahaina. Paia Fish Market is a Maui institution. No matter what you order, do not leave without ordering their French fries and coleslaw. Everything on their menu is tasty and fulfilling, but these two sides steal the show. This Maui eatery is casual, cool and satisfying. The dining area is super laid back with share picnic table-style seating, and the menu prices are reasonable. They always have great tunes, and the vibe is welcoming. Here’s an excellent place for the whole family. Whether you’re at a Paia Fish Market for Lunch or Dinner, the menu is the same. Although there’s quite a lot of menu choices, their most popular items are their Fish Burgers, but you can also order a chicken burger if you’re not into fish. 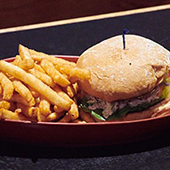 The burgers are garnished with their fantastic coleslaw, tomato, jack cheese and house-made tartar sauce. The burgers don’t come with fries, so just add-on a side for a couple of bucks. Pasta, Quesadillas, Fajitas, Fish & Chips and Shrimp & Chips are also smart ideas at Paia Fish Market. In fact, if you love a good Caesar Salad, they have a great one here. For Fresh Catch Plates, guests first choose a fish type and then a preparation style. Fresh Catch Plates come with their yummy coleslaw, tartar sauce and a choice of Cajun rice or French fries. For drinks, Paia Fish Market has your usual array of refreshments, but you can also order a glass of wine or a Maui craft beer to partner up with your amazingly satisfying meal. At Fleetwood’s, guests can listen to a variety of live local musicians throughout the week, while being located in an ideal location for relaxing with a loved one enjoying life. Dinner at Fleetwood’s is delicious with wonderful menu items. Handcrafted Cocktails offered at Fleetwood’s are made with the highest caliber spirits and ingredients, and the Wine List is truly divine with an international selection of champagne, sparkling, white and red wine varieties. If you’re looking forward to having wine with dinner, make sure to try the Mick Fleetwood Private Cellar Cabernet Sauvignon or “Red Ransom.” Only available at Fleetwood’s in Lahaina, these two wines are produced just for Mick by Lucas & Lewellen Vineyards in Santa Barbara, California. 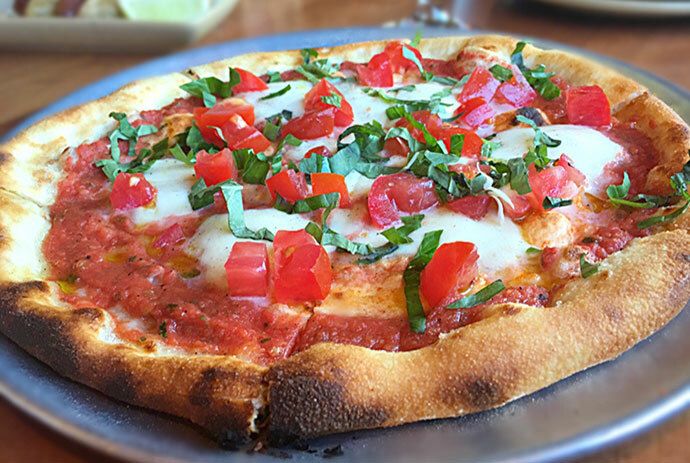 Flatbread Company is the best casual, family-style restaurant on Maui. Located on the North Shore in the Historic Town of Paia, this restaurant provides guests with the best flatbread pizza and salad selections in all of Hawaii, made with local organic ingredients. The permanent menu is simple and streamlined, with a solid selection of flatbread pizza and salad choices. Each week, Flatbread provides one “Carne,” and one “Veggie” special, allowing guests the rare chance to taste the many flavors of sustainable Maui ingredients. The cocktails are brilliant, bartenders are awesome, the crowd is social and fun, the service is professional and friendly, and the music is the best. Located between Sansei and Foodland in Central Kihei, Cuatro is a local favorite for happy hour and dinner on Maui. It’s one of the most popular restaurants in Kihei, and a great place to enjoy a relaxing and impressive meal in South Maui. Besides an awesome menu, one of the best things about Cuatro is that it’s BYOB (with a $10 corkage fee). So, you and your friends can grab your favorite bottle of wine or beer at Foodland right next door to this restaurant. 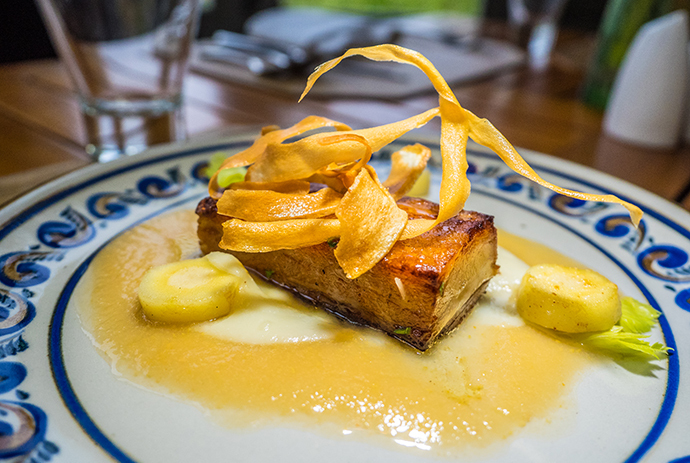 The menu is streamlined and fresh, and there’s a certain ‘Cuatro’ twist to classics. This is a perfect place to enjoy a pre-sunset meal before walking across the street to enjoy the views from Kihei’s Cove Park. Located on the North Shore of Maui in the historic Town of Paia, Cafe Des Amis is set alongside an old plantation town known for an international array of water athletes, cute boutiques, a fabulous health food grocery and unique restaurants. Café Des Amis made our Top 30 list because of their food, service, and ambiance. It’s a cute little place with a covered courtyard, so you can enjoy both indoor and outdoor dining here. Café Des Amis serves a blend of Mediterranean and Indian food and has been a favorite Paia eatery for breakfast, lunch, and dinner for over 15 years. Here, you’ll find that their savory crepes, sweet crêpes, wraps, salads, and curries are legendary. The mango chutney and the cucumber raita really enhance the flavors in all dishes, so definitely ask for a side if your plate doesn’t come with them. Cafe Des Amis also has smoothies, great wine and cocktails, awesome coffee drinks and LIVE music in the courtyard around sunset time during the week. Plus, the prices are reasonable, especially for the high quality of food that they serve here. There are so many wonderful items on the Cafe Des Amis menu, you’ll definitely want to go back to try them all. Perched oceanfront in Lahaina, the Lahaina Fish Company, is one of the best spots for casual dining and outrageous views on Historic Front Street. Since 1990, this Maui hot spot has been a favorite for both residents and visitors. The menu is expertly crafted, and the vibe is classically Maui for a great meal surrounded by island views. Whether you visit Lahaina Fish Company for Lunch or Dinner, you won’t be disappointed. They have items for everyone regardless of dietary restrictions; meat, seafood, gluten-free, vegetarian and vegan options. Plus, a Kids Menu. For Lunch, start with a few appetizers for the table. We love their Wok-fried Brussel Sprouts, Hawaiian Sea Salt Fries, and Kula Strawberry & Goat Cheese Salad. Heavier lunch items include a yummy Taro & Lentil Burger, Maui Style Pork Ribs, and Prime Rib & Lobster Fajitas. Dining oceanfront is an absolute must when visiting the Valley Isle. At Lahaina Fish Company, guests get the best sunset view in West Maui plus delicious cocktails, wine, and an incredible Dinner menu. 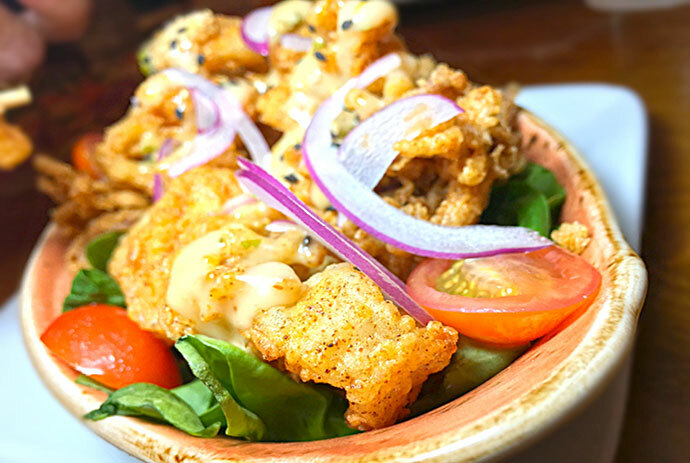 Start with their Crispy Calamari, Signature Ahi Katsu, and Artichoke Heart Fries. Matteo’s off the beaten path in the Wailea Town Center. This top Maui restaurant has a lovely menu and a spectacular wine bar with over 64 wines available by the glass. It’s a wine lovers dream come true on Maui! There are some very impressive wines from Italy, California, and Argentina, so a wine lover will surely feel at home here. Chef Matteo is the man who started it all, and after many years in top-notch kitchens around the world, he’s effectively created a welcoming space with design and décor that says, ‘I’m from the old country’ but with a ‘living it up in paradise’ kind of a vibe. Matteo’s Lasagna is a super thin homemade pasta in a perfect meat sauce; it’s considered by many to be the best lasagna on Maui. If you enjoy a classic executed Tiramisu, Matteo’s is the place to go. The Apple Tart is a puff pastry, with thin slices of almost sweet apples, a Chianti strawberry glaze, and a small scoop of rich vanilla gelato. Simply delicious. With great service, fantastic food, and an array of delicious wines to choose from, Matteo’s is a great choice for premium Italian food in Maui while on a dinner date, or for meeting with friends for Happy Hour. 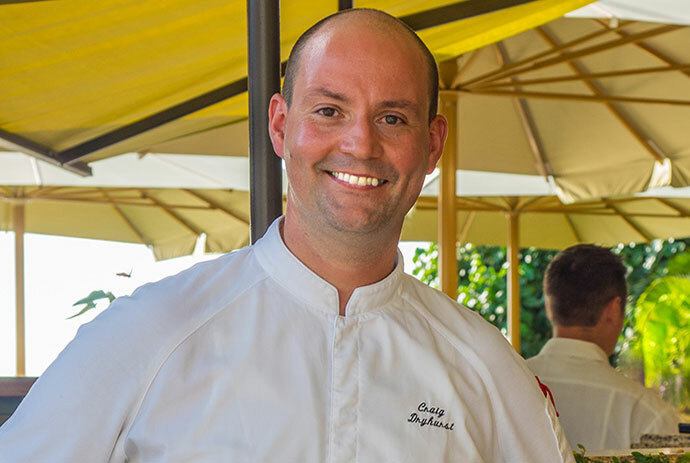 Café O’Lei at The Dunes in Maui Lani is the newest collaboration of husband and wife team and chef-owners, Dana and Michel Pastula. 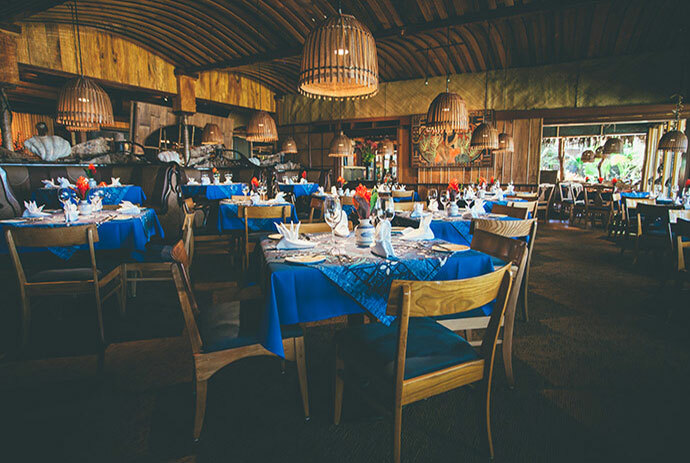 This family run restaurant is located in the Clubhouse at the Dunes at Maui Lani Golf Course. Guests will surely enjoy this tucked away oasis, offering a comfortable, and laid back atmosphere with plenty of seating. Choose from inside or outside patio dining with amazing views of the picturesque golf course. The West Maui Mountains is your backdrop! 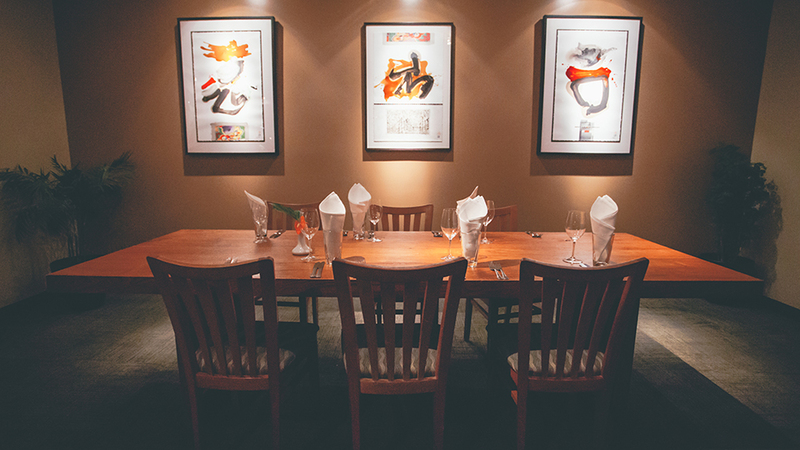 This is a great spot for friends and family to gather, or for a business lunch. They’re open for breakfast, lunch and dinner. We love the Macadamia Nut Crusted Chicken served over rice, and served with your choice of fresh local baby greens or a Caesar salad. The Maui Onion Soup en Croute and the Fried Local Green Beans are two of our favorite starters. Be sure to ask your wait staff about the daily specials. We recommend making reservations, as this place fills up, especially during the lunchtime hours. For more information, please visit Café O’Lei.